It’s a symptom of modern living—we space out at work to read the news, shop, and play. It’s okay, I’m not judging you. But there are ways to help yourself stay focused and become more productive every day. 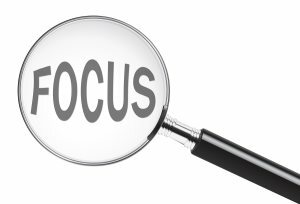 Staying focused takes effort and practice, but the gains can spell great benefits for your career and life in general. One of the easiest ways to keep your mind on track is to have some kind of goal that you are working toward. We are a task driven species and find it far too easy to become aimless and inefficient in our work. Make sure to always have a goal in mind for whatever it is that you are doing. Every job that you perform needs an end point—a signal that it is time to do something else. If you find yourself doing several things at once it’s time to prioritize what needs to get done and approach each task in a methodical manner until it is complete. It can help to write down a few words to describe what it is you need to accomplish. Keep a list of your tasks, scratch them off as you complete them, and focus on one item at a time. Once you can see a clear endpoint you will tend to feel more motivated about completing your work. The urge to slack, like any temptation, is enabled by the presence of the myriad of modern distractions: texting, online shopping, Angry Birds, social media. The important thing to battling the urge is to remove as many distractions and potential sources of interruptions as possible. While you can’t do much about some interruptions, such as a visit from your boss or meeting the needs of a client, you can wear headphones to avoid any unnecessary chatter with coworkers and let your phone go to voicemail to somewhat control certain external events. Get control over your distractions by closing your inbox, social sites, and other unnecessary applications to let you focus on the task at hand. In order to keep your mind from blanking from excessive concentration, try to work in short bursts of between 30 to 45 minutes at a time. It is crucial to stay focused during your work time, but give yourself a few minutes between work blocks to recharge. And if short breaks aren’t possible due to your job, try switching between tasks that require more and less focus. Perhaps you can spend 30 minutes on a project requiring intense mental effort followed up by 15 to 20 minutes of lighter tasks, such as answering email. By creating a work structure that encourages staying focused, you will find it easier to concentrate on boring tasks, complete tasks quicker, and even create more time to relax and distract.